Every camper, urban and end of the world survivalist needs a powerful and reliable flashlight. 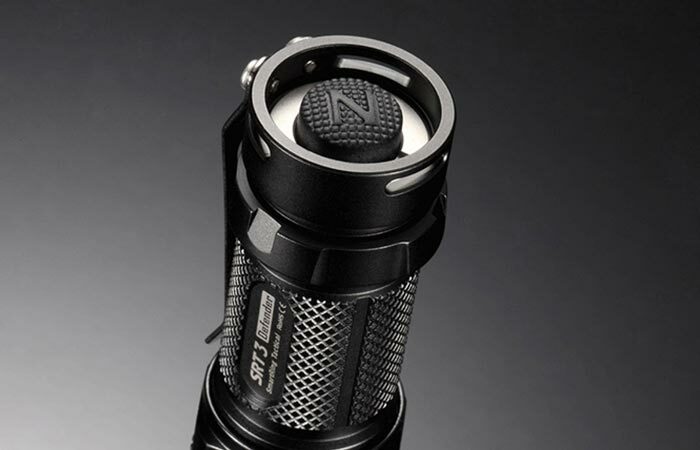 The SRT3 ‘Defender’ by Nitecore is one of the most reliable flashlights currently on the market. Very light and small, but powerful, this flashlight could really come in handy as an everyday carry object. This flashlight has a wide span of features, alongside with 6 different modes available. There are no limitations when it comes to brightness adjustment. The Defender has a max beam output of an incredibly powerful 550 lumens. That will allow you to temporarily blind someone who is threatening you, and of course, you can reduce the output to a lower level in order to illuminate your path. It’s 100mm and it only weighs 73g without battery. The maximum output is not recommended at all times, simply because it’s just too bright and it will eat your battery faster. So, if you’re using this flashlight while fixing your car or just walking down some dark street, use it at a lower capacity. 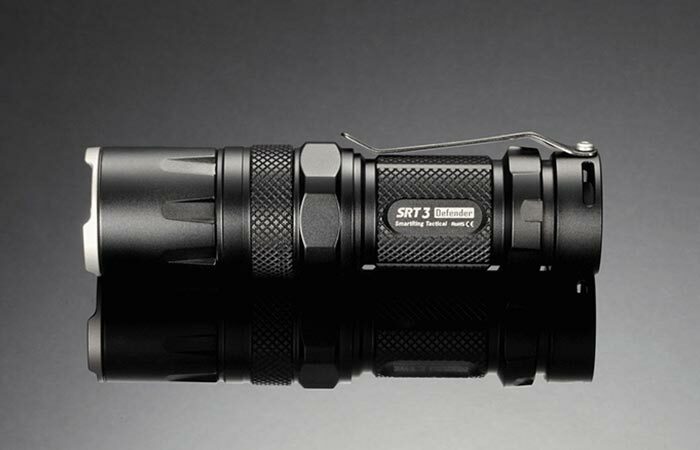 This flashlight is used and approved by law enforcement and military. The maximum beam distance is 134 meters (440 feet). That is pretty good and seeing something that far will provide you with enough time to react. If you find yourself in a survival situation, this flashlight will run for 200 hours or 8.33 days without charging the battery, so no need to panic, that time will allow you to find your way out from the dark. If somehow you don’t find your way out, the Defender offers 5 other modes and some of them may save your life. It has a location beacon, a red and blue warning light, an SOS signal and a strobe mode. This flashlight uses a lithium (CR123 – 3V) as a primary battery, but it can also use rechargeable lithium (RCR123 – 3.7V), rechargeable lithium (14500 – 3.7V) or a rechargeable AA (1.2V) battery. Maximum output of light is 550 lumens and the maximum distance is 134 meters. 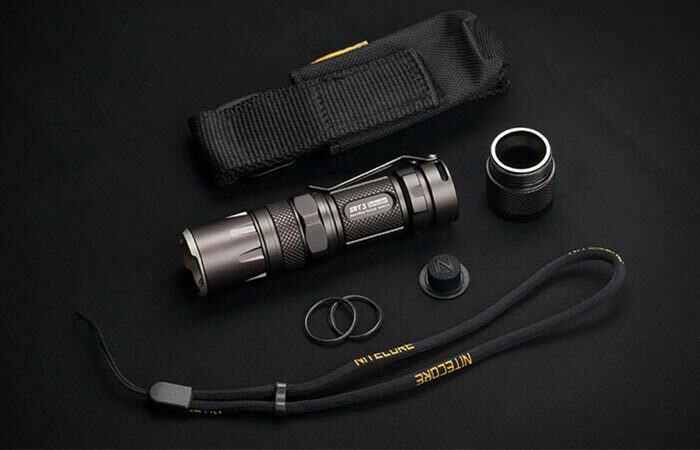 Nitecore Defender uses a CREE XM-L2 T6 LED and an SMO reflector. These two are producing a maximum beam intensity of a 4500 cd. The main color of the beam is white. 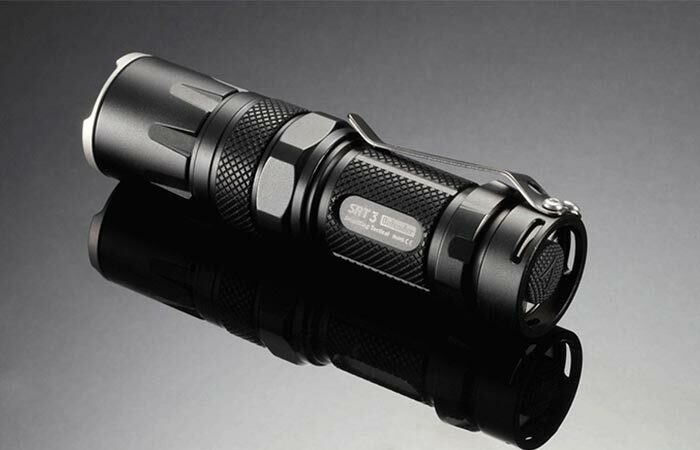 Regarding the built and design, this flashlight is very sturdy and durable. Its precision reflector is safely located behind a stainless steel cover that can also be used for breaking glass in case of an emergency. 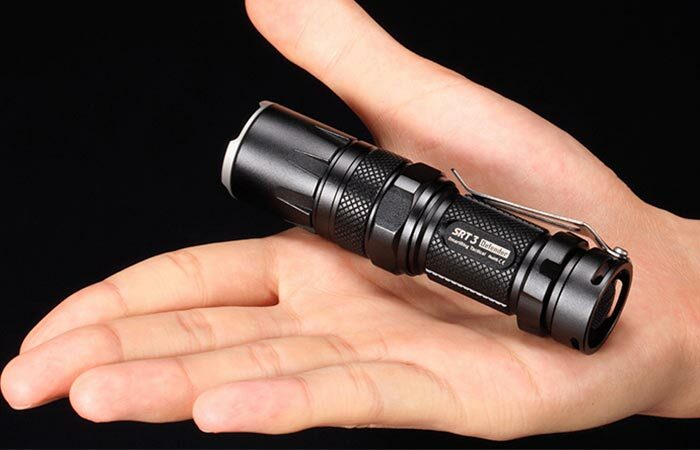 This EDC flashlight is 100 mm(3.94 inches) long, it has a 25.4 mm (1 inch) head and it weighs just 73 g(2.57 oz), so you can bring it with you anywhere you go. Just clip it wherever you want with a titanium coated pocket clip and you’re ready to go. Lithium battery provides up to 200 hours of use on lowest output level. The SRT3 Defender by Nitecore is used by people from law enforcement and military, but it can also come in handy at your home, on a camping or a fishing trip, or simply as an EDC item that’ll become natural and essential part of your equipment. In the box, you’ll get one flashlight, a stainless steel pocket clip, wrist lanyard, spare O-rings, spare tail-cap switch cover and 3-way holster. Check out what this 550 lumens “Defender” by Nitecore can do.